Following successful sales figures for June and the first half of 2015, MG Motor UK is calling for more dealers, specifically smaller groups, to join the brand and forge a strong relationship to drive results forward together. The latest new car registration figures, released by the Society of Motor Manufacturers and Traders Limited (SMMT), showed that MG’s June 2015 performance was almost 20 per cent higher than last year; whilst the year-to-date saw a rise of just fewer than 40 per cent. Looking forward, MG’s hopes to continue these successes is dependent on its growing and dedicated dealers and the loyal and supportive customers they serve. MG is calling for prospect dealers to join the franchise and be part of a company that cares more about building strong relationships than the colour of the tiles in the showroom. Matthew Cheyne, MG’s Head of Sales and Marketing, said: “We’ve had another great half year, and we can only hope that the remainder of 2015 will be just as, if not more, successful for us. In order to achieve this, though, we need the right sort of dealers. We’re looking for the smaller groups, perhaps family owned, that have strong local relationships and are fed up of how they are treated by other manufacturers. “We want to work with dealers who strive to deliver a great service and have a say in how they want their franchise to go in the future. We also want to reassure prospect dealers that we’re not going to come into your showroom and demand for the tiles to be changed, or to have different style coffee cups; we care more about listening to you, forging a strong relationship, and building a franchise for the future, together. The iconic British MG brand can trace its history back to 1924 and is world famous for making stylish cars that are fun to drive and own and are sold at remarkably affordable prices. Modern MGs, which are designed, engineered and finally assembled in Longbridge, Birmingham, continue this long and rich MG tradition. Two cars currently come off the Longbridge assembly lines: the MG6 and the MG3 with several models planned for the immediate and longer-term future. The MG6 is a medium-sized fastback offering fantastic dynamic handling, high levels of interior comfort and a tremendously spacious cabin area with a cavernous boot. The MG6 won the 2014 Auto Express Driver Power Best Handling Award. The MG3 is a new generation super-mini which brings fun and style to this sector of the market at very affordable prices. The 1.5-litre petrol-powered car can also be personalised, so owners have the option of giving their car their own style-statement. 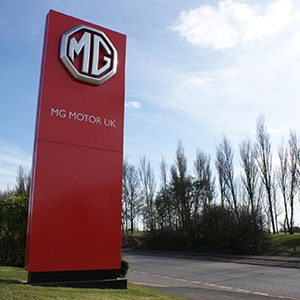 MG was voted the fourth best manufacturer in the UK in the Auto Express Driver Power Awards in 2015. MG was the fastest growing brand in Britain in 2014 as shown by official figures issued by the Society of Motor Manufacturers and Traders. Currently MG has the fastest growing network of dealers in the UK as sales continue to surge.